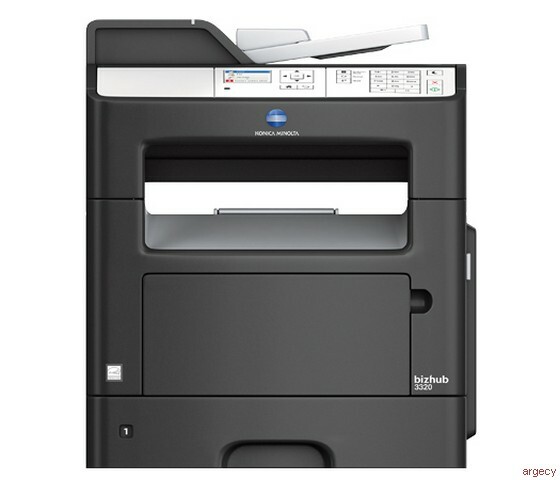 With fast B&W print/copy output and color scanning, the bizhub 3320 B&W All-in-One Printer is a high-value addition to mixed networks of large and small MFPs as well as an all-around document solution with built-in Super G3 fax for low-cost productivity. Document Feeder Specifications Capacity: 50 sheets; Paper Size: 4.13" x 5.83" to 8.5" x 14"; Paper Weight: 14 to 32 lb. Standard Paper Tray Capacity: 250 sheets; Paper Size: 4.13" x 5.83" to 8.5" x 14"; Paper Weight: 16 to 24 lb. Dimensions (W x D x H) / Weight 15.3" x 18.6" x 18.4" / 44 lbs. *The bizhub 3320 ships with a starter toner cartridge (yield: 2.5 K). Konica Minolta Return Program cartridges are patented print cartridges sold at a discount in exchange for the customer's agreement to the license requirement that the cartridges will be used only once and returned only to manufacturer for remanufacturing or recycling. These patented cartridges are licensed for single use only and will stop working after delivering a fixed amount of toner. Toner may remain in the cartridge when replacement is required. Replacement cartridges sold without these restrictions are also available. Please contact your Konica Minolta representative for further details and availability.